This is from Tuesday morning, before we started working. 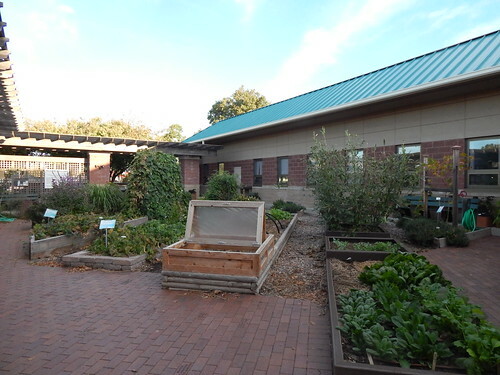 We got the cold frame out last week for a tour, although we haven’t needed to close it yet. Maybe tonight before we leave. And this if from this morning. We did leave some of the herbs in, because we just couldn’t take them out when they were still looking good. I suspect that they will have to come out after this weekend. We ended up with quite the pile in the “ready to compost” bin. 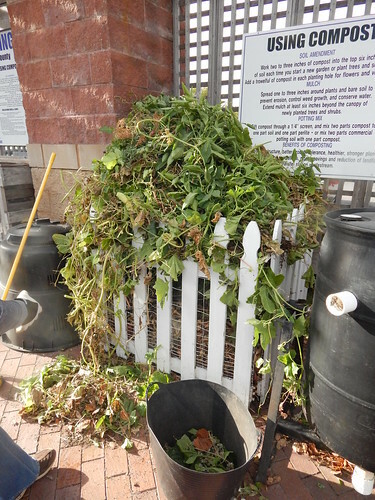 Some of it may end up being to fibrous to easily compost, but it needed a chance! The radishes were ready to harvest, so we pulled most of them. This is what happens when you plant all the radishes at once rather than staggering them. 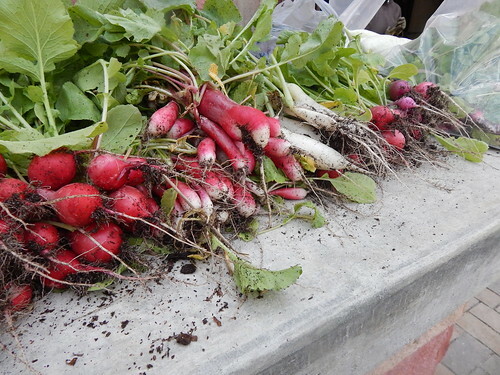 You get a LOT of radishes all at once. 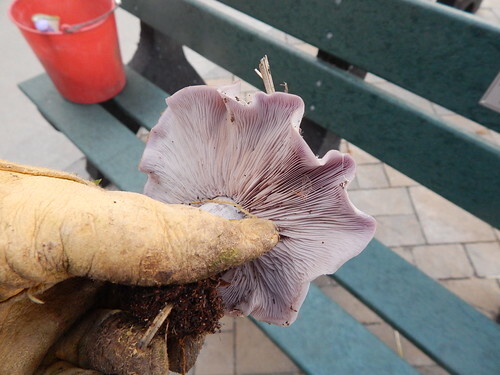 We found these cool, lavender mushrooms growing under the cowpeas. No, we didn’t eat them, since we weren’t sure what they were. 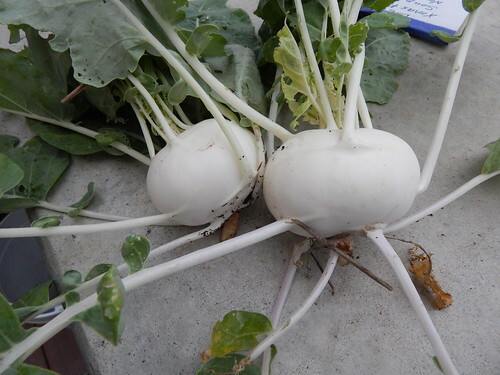 A couple of the kohlrabi were ready to harvest, so we gave them a taste test. If you’ve never had kohlrabi, they taste a lot like a turnip, but a little sweeter and more mild. The mystery of the browning leaves on the horseradish was solved…by actually looking more closely at the plants. They have a bunch of harlequin bugs making a home on them. 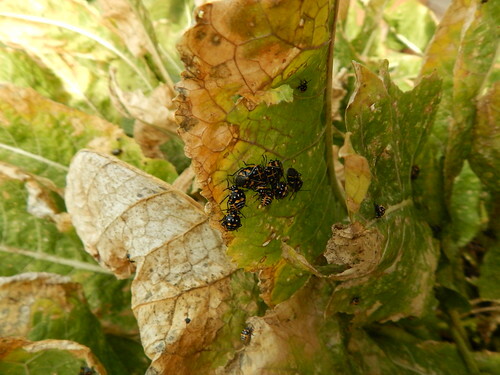 These bugs are most commonly found on kale, so I was a little surprised they were on the horseradish. Given the upcoming cold weather, we decided not to worry about them for now. Especially since it’s highly unlikely they will come close to killing the horseradish. 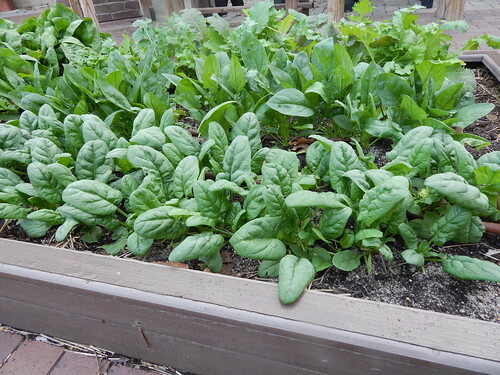 The spinach is looking great, and I expect it will continue looking good for weeks to come. 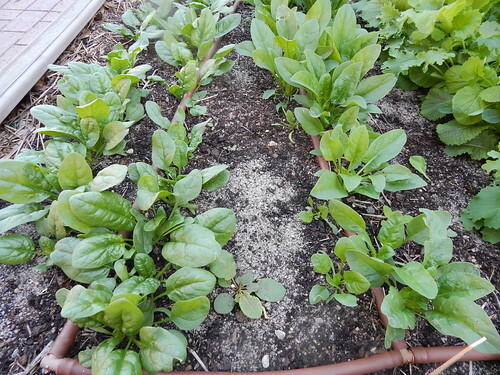 Fall spinach is the best, especially as the weather gets colder and the leaves get sweeter! We may be on an every other week schedule for Friday PhotoEssays for the rest of the month. Next week looks pretty crazy, and then we’re doing garden cleanup the following week. Other than the shade covering half the garden, there aren’t a lot of visible changes without closer inspection. Some of the warm season plants that are still in the garden have gotten a little zapped with the colder nights. 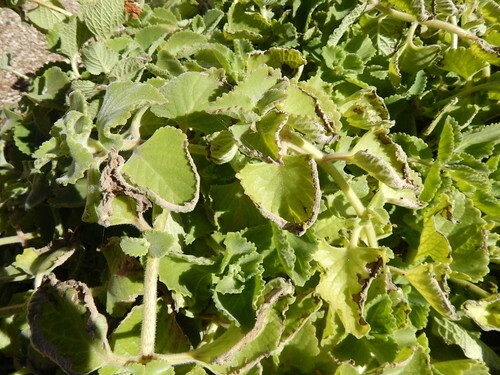 Case in point: the Cuban Oregano (or Ajwain, since it’s in the Taste of India Garden), has clearly experienced some cold injury with the browning and curling of the leaf edges. In contrast, the radicchio is finally starting to show some nice red color! Most of the plants are also forming heads slowly, although they aren’t yet very solid. There are two different types of spinach here. The one on the left is ‘Donkey’ and the one on the right is ‘Giant Winter.’ We usually just pick a variety and plant it, so it is kind of fun to have two different types right next to each other. 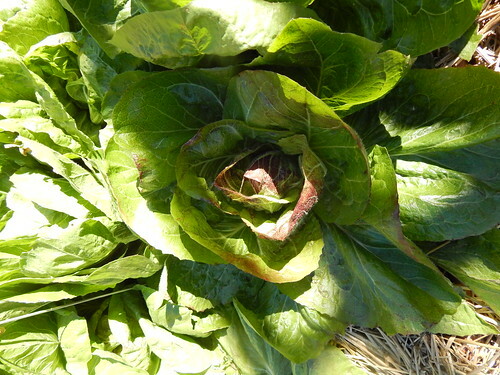 The Donkey variety is a little slower growing, has more rounded leaves, and the leaves are partially savoy (crinkled). The Giant Winter has larger leaves, seemed to grow faster, has longer stems, and has smooth leaves. Taste? Pretty similar, at least right now. 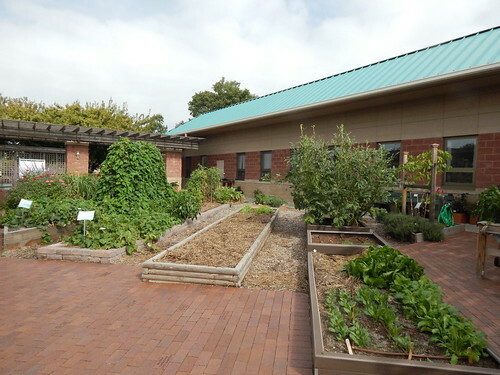 Next year the Herb of the Year is Savory, so we wanted to get a head start by planting some of the perennial savories in the garden this year. 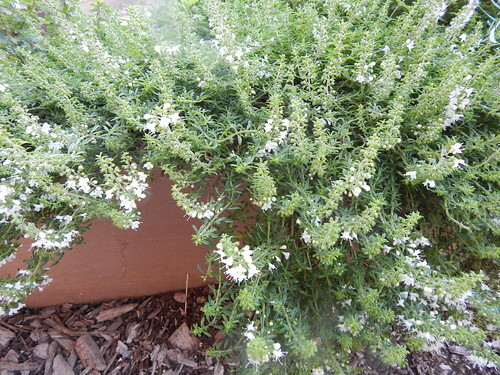 The summer and winter savories both died, but the Creeping Savory has taken off! It is blooming now, and looks great! 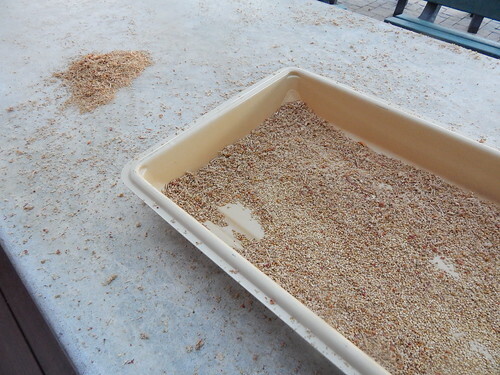 We did strip some of the quinoa seeds off the stalks, and tried out the “blow dryer” method of separating the seeds from the chaff. It actually worked pretty well! It isn’t perfectly clean, but it’s a start. 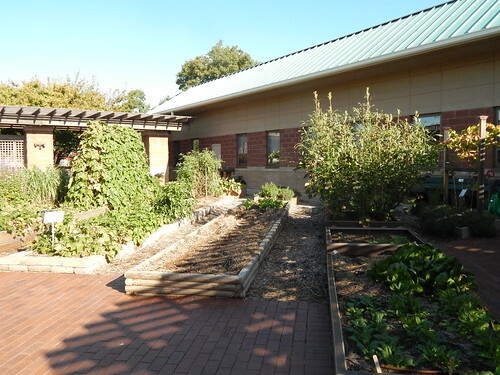 Since I haven’t been very good about regular updates this summer, I figure it is about time I start doing some “Year in Review” posts to look at how certain groups of plants or garden beds did for us this year. The easiest and best place to start is the tomato garden! We had a bunch of heirlooms in our Tomato Garden this year, and we had Master Gardeners plant them in their home gardens as well to give us more information. I had some of the varieties in my home garden too, so the information isn’t going to be strictly based on what we saw here in the Demo Garden, but kind of a combination of all that information. ‘Silvery Fir Tree’ – This heirloom was determinate, 3-4 oz. red fruit, purportedly 52 days to first harvest, and had cool silvery and kind of fine foliage. The general consensus was that while it was relatively early, the yield wasn’t very good and the flavor was even worse. Not much to recommend this one! ‘Large Red Cherry’ – This was an heirloom cherry tomato that we put on the trellis. 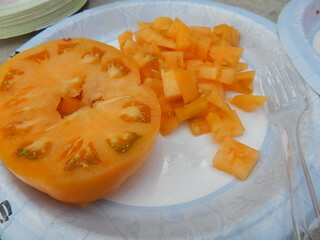 The fruit was about 2 oz, which is large for a cherry tomato. Our vines in the Demo Garden were diseased pretty early in the season, so they never really produced well or looked healthy compared to others. 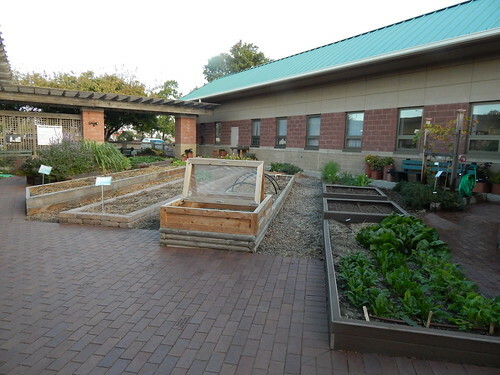 Some of our Master Gardeners that tried this variety raved about it and how productive it was. I didn’t find the flavor to be particularly good or particularly objectionable, but others liked it. Worth a try, especially if you like large cherry tomatoes. ‘Northern Lights’ – One of the reasons we chose this bi-color heirloom was because it was supposed to reach first harvest in 54 days with up to 1 lb. fruit. Well…it didn’t hit that mark, and wasn’t even the first variety ripe. It was relatively early, with first harvest the week after July 4th, but most of our varieties were much earlier than the days to maturity would indicate this year. I also have to be honest – I LOVE this tomato. I love the color, the fruit size, and the flavor. It is a little milder than some varieties, which I like. I had this one at home as well, and it averaged close to 1 lb. fruit most of the season. We had almost 100 lbs of tomatoes from 4 plants, which was pretty impressive. It also DID NOT CRACK. At all. Which in itself is pretty impressive for Kansas, especially when we had rainy and dry periods. I would like to see how it performs in a more normal Kansas summer, but it was great this year. I personally would highly recommend this one. Based strictly on our Demo Garden results, I would probably give it a recommended rating. 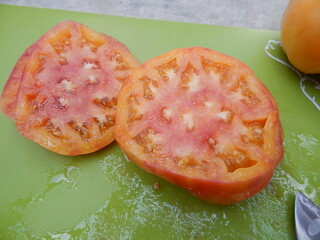 ‘Pink Russian 117’ – This was a pink skinned and fleshed oxheart tomato. While I did hear some rave reviews of the flavor, a couple different times when we did taste testing it was rated as pretty bland and mealy compared to the other heirlooms. I think the ripeness really plays a role in its flavor. If it gets a little over-ripe, the flavor and texture go downhill quickly. In the Demo Garden, it wasn’t very early to start producing, but it wasn’t incredibly late either. The earlier yield was decent, but tapered off quite a bit. At home I just had one plant, and the first harvest was about 2-3 weeks later than other varieties. The yield was pretty minimal, especially compared to the other heirlooms, but I wasn’t concerned because the flavor wasn’t as good either. Not recommended. If you want a pink tomato or an oxheart shape, there are probably better options out there. summer, that could have been a death knell for this variety as it probably wouldn’t have set fruit before it got too hot to set. This year, it was producing well before the 70-75 day mark, so I don’t know if that is courtesy to the strange summer or due to how the variety performs in Kansas! 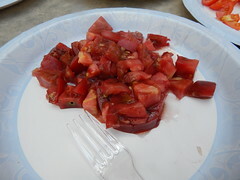 Everyone generally liked the flavor, although it wasn’t as mild as Northern Lights nor as strong as the Black Krim. Based on the Demo Garden alone, I would call the yield pretty average. I know that other Master Gardeners with this variety at home reported good yields. I would rate this one somewhere between “worth a try” and “recommended” because I’m still a little skeptical about the days to maturity and how that would play out in a hotter summer. exception. The flavor was great! Another common characteristic of this variety, unfortunately, is the concentric cracking on the stem end, and that was evident this year as well. The real key with cracking is to pick the tomatoes before they reach full ripeness, which generally mitigates most of the cracking. We also had this variety at home, and it did very well. 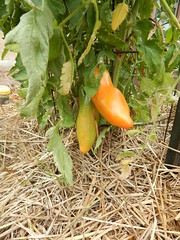 The yield was very good, especially for an heirloom, it produced early and consistently, and tasted great. As an earlier variety, it should produce some in most Kansas summers. Highly recommended. really seem to hit its stride until August. The yield was tolerable, but nothing compared to the hybrid romas I had growing. However, most of the fruit were HUGE! I mean…1 cup of tomato sauce from a single tomato? That’s crazy! The texture and flavor were also really nice for cooking. They definitely weren’t as firm as the hybrids, but that’s not necessarily a bad thing. So…if you want huge, novelty romas, this would be a fun variety to try. If you want to do lots of canning, probably not a great choice. I will also say that I had grown this variety before, and it was nothing like this before, so one packet of seeds or the other was not true to type, and I don’t know which one was! Ah, the joys of growing heirlooms. We did have some hybrids in the garden this year as well, but we’ll take a look at them in another post. It is cold this morning! In fact, it is colder now than when I got up this morning. Brr! As you can see, the tomatoes are gone! All the heirlooms were removed, ans well as the Jet Star from the MG Faves garden. We also removed the trellis over the walkway, as the plants were pretty much done and diseased. The Juliet tomato is still going strong as the only remaining tomato plant in the garden. 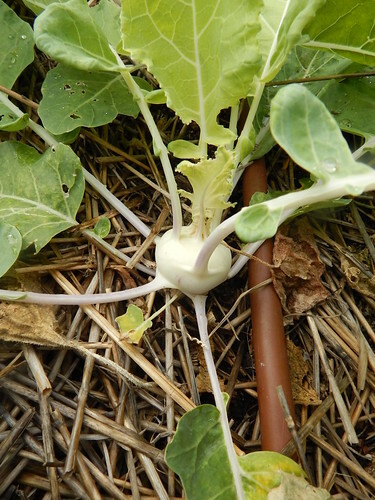 The kohlrabi we transplanted earlier this fall is starting to form the bulbs. They still have a ways to go, but it is always fun to see plants progress. 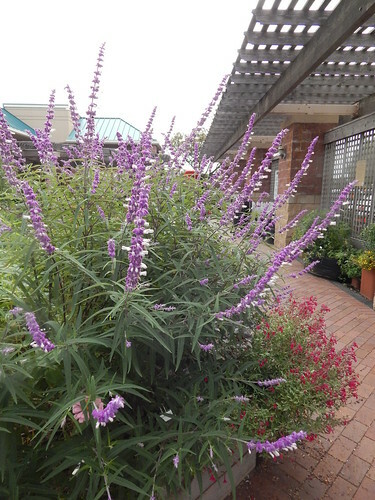 The Herb & Flower & Pollinator Garden has been quite a chameleon this year, with different plants taking center stage at different times. Right now this Mexican Blue Sage is clearly the star (as well as behaving like something of a thug in growing over other plants). In hindsight, I wish that I had taken weekly pictures of this garden to capture the transformation. 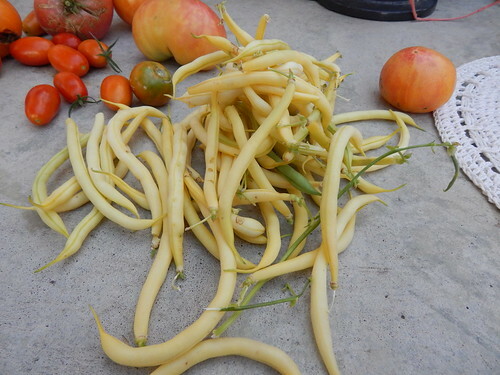 We have been getting some really nice yellow (wax) beans from the ‘Rocdor’ bean plants that were planted in late July. I don’t know why, but I prefer yellow beans over the green. 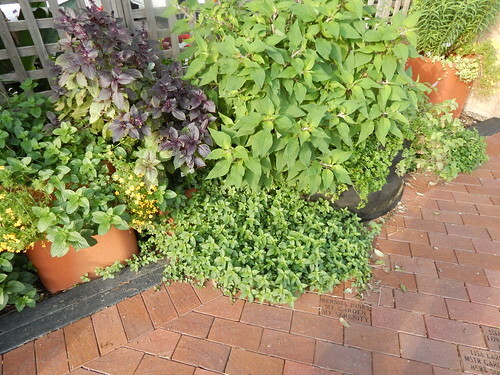 Our container herbs have done fairly well, although I noticed this morning that the pineapple sage (the big green plant at the top of the picture) still hasn’t started blooming. It may not get quite enough sun there. The other thing I noticed is that the mint has escaped the containers in a couple places. It seems to be quite fond of the location. Oh well, at least it isn’t in one of the raised beds?